The PzKpfwV Panther G was once part of the original Armored School Museum that eventually became the Patton Museum of Cavalry and Armor. The Panther, along with other foreign vehicles, was part of a shipment that arrived unannounced at Fort Knox by train from the Aberdeen Proving Grounds (APG) in 1946. Photos of the Panther G in the old Patton Museum on old Ironsides Ave. show it missing its outer row of road wheels and track, though two sections of track can be seen below it. Possibly the wheels and track were removed because of railroad width restrictions and the wheels and tracks came with the Panther, but were not re-installed after arrival. The M.A.N. built Panther G abandoned in downtown Munich is inspected by U.S. Army personnel. It has steel wheels at the last station and flame supressor exhausts. How the Panther was chosen for the Patton Museum is not entirely known. It, along with several vehicles, was supposedly picked by General Patton late in the war from a vehicle collection point for the purpose of being sent to the Armored School at Fort Knox. It was also reported that the Panther G and other German vehicles were sent from APG to Fort Knox after testing on them was completed in response to a general request for foreign vehicles to be displayed in the Armored School Museum to be used in the training of armor crewmen. 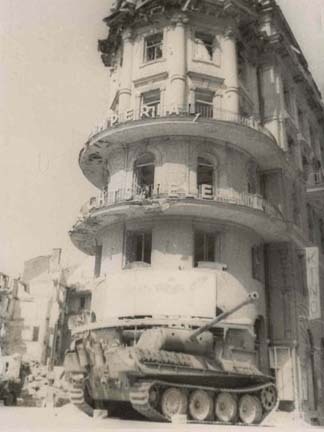 Another photo of the Panther G showing the "Imperial Lichtspiele" cinema it was parked in front of. The source of this photo is unknown. 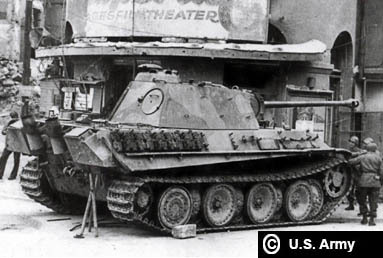 It wasn't until recent years that war-time or post-war photos of a Panther G sitting abandoned on the Karlsplatz in front of the cinema "Imperial Lichtspiele" in Munich, Germany taken by the Signal Corp or G.I.s surfaced either on the Internet or published in books. References to this Panther can be found on the Missing-Lynx forum, Wehrmacht Awards forum and in the edition of Panzerwrecks No. 15 by Lee Archer & William Auerbach. 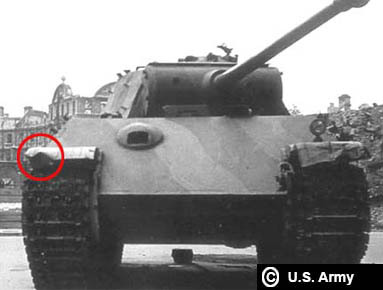 Front view of the Panther G with the distinct damage to its right fender circled in red. The green and brown camouflage pattern is evident. 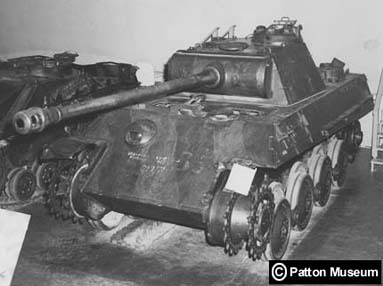 At some point someone, unknown at this time, made the connection that the Panther in Munich was the same Panther in the Patton Museum collection. Several identifying features help make this case. 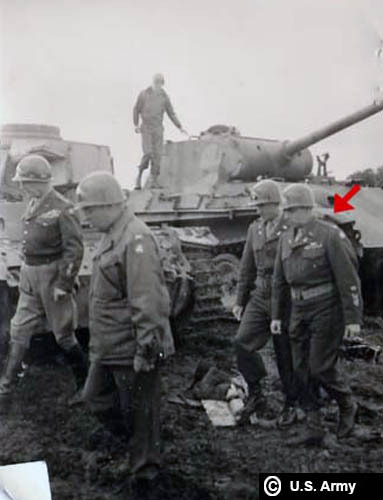 First there is a distinct dent in the right fender that is exact in both the photos in Munich and the Patton Museum. There is also the fact that both vehicles were built by Maschinenfabrik Augsburg-Nürnberg (M.A.N.) because they both have all steel road wheels at the last station, a feature found only on 24 M.A.N. produced Panthers. Both vehicles also have the Flammenvernichten (flame suppressor) exhausts and the camouflage pattern on both vehicles is a match. Since the Panther has the fahrgestell number of Nr 121455, it was built by M.A.N. in April 1945, about a month before the war ended. How the Panther came to Munich can be found in after action reports of the 21st Panzer Division, Panzer Regiment 22 found on the web site "Panther 1944" and other sources. Most of the 21st Panzer Division was encircled by Soviet units in a largely forested area south of Berlin known as the Halbe Pocket. However, the division's II. Abteilung, Panzer-Regiment 22 had remained in the West still refitting. On March 30, 1945, Panzer Regiment 22 was still in the Grafenwohr training area, almost fully replenished but lacking tanks. On April 6 they were ordered to pick up 22 new Panthers from the M.A.N. factory in Nuremberg with orders to proceed to Bamberg to join with the 2nd Panzer Division. These orders were changed and the battalion was instead ordered to join Kampfgruppe von Hobe, also referred to as Panzer-Brigade XIII. The regiment was deployed with Kampfgruppe von Hobe to the Steigerwald Line north of Nuremberg near Würzburg to defend the area from the U.S. 12th Armored Division. There they fought for several days until the regiment conducted a fighting withdrawal through Nuremberg. It was reported that the regiment split up with some elements routing through Munich and then eventually surrendering near Rosenheim near the Austrian border while the remainder of the regiment made it to the Linz, Austria area before surrendering. Looking at the photos, the like-new condition of the Panther would confirm a recent acquisition from the M.A.N. factory. Except for the minor damage to the front fenders, which was common, and damage to the schurzen rails on the side, there doesn't appear to be any other damage to the vehicle. The rear stowage boxes in many cases became damaged over time, but these are completely undamaged. The factory paint job of Olivgruen (olive green) RAL 6003 and Rotbraun (red brown) RAL 8017 seems virtually complete with little discernable wear. Third Army commander General George S. Patton far left with staff members looks over captured German equipment at a collection point. The Panther G, with the dented fender is in the rear. The Panzer III F also appears to be another vehicle that would eventually be sent to the Patton Museum. This entry reported by Mirko Bayerl on the Missing-Lynx forum is interesting. He basically said that he had talked with his father's friend who lived in Munich who remembered the Panther coming into the center of town (Stachus). He said that the tank commander, an older man around 35-years-old with a black uniform jumped down from the tank and talked to some Volksturm with panzerfausts and others and said, "The war is over. I have no petrol left and no ammo for this tank, so everybody go home!" With his crew behind him the tank commander also told the curious civilians and children to back off from the tank and go home. Later the man and his child returned to the tank and climbed inside and managed to rotate the turret. He remembered that the tank was empty and there were no radios. The photos show that the tools and other items stowed on the tank are missing, undoubtedly claimed by the local populace along with the radios. 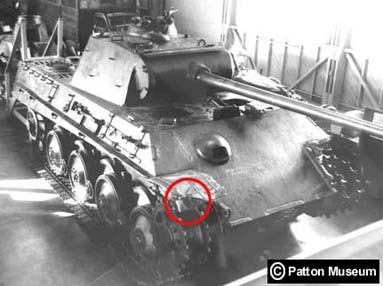 The Panther G on exhibit at the old Patton Museum on Old Ironsides Ave. Again, circled in red, is the same damaged fender as in prior photos. The Panther is missing its outer road wheels and is resting on the remnants of its tracks. In reference to the camouflage paint, it is a factory-painted pattern of hard-edged stripes of brown and green. The tank also is void of any tactical numbers and national insignia which was normally added to any vehicle assigned to a unit. This also attests to the haste with which it was acquired from the M.A.N. factory and then put into action. It is unknown how much of the original paint remained when the Panther arrived at Fort Knox. It most likely spent much of its time at APG in the open subject to weather which degraded its paint and years of museum visitors climbing on it at Fort Knox only made it worse. The faint remnants of the pattern are still discernable in black & white and color photos taken in the 1950s and 60s. In later years the Panther was moved to another area in the museum with the tracks now laying underneath. The remnants of the camouflage pattern is evident in this photo and matches the Panther G in Munich. Over the years, the Panther was subjected to questionable paint jobs and modifications. One modification was the removal of the last wheel station rocker arms and steel wheels. Also the original fenders were removed and replaced with what looked like sections of 55 gallon drums. The unique flame suppressor exhaust system was also removed and replaced with two lengthy pieces of pipe. The most notable modification came after the museum had acquired the Panther II in the mid 1980s. At that time, the battle reenactments in Keyes Park behind the museum had been started which drew hundreds of spectators. These battles consisted of several vehicles in the museum collection doing a mock battle every July 4th. For whatever reason, the Panther II was selected to be made into a runner to participate in these battles. Because there were parts and pieces missing, the Panther G was cannibalized to complete the Panther II. Also, for reasons unknown, the Panther II turret was replaced with the Panther G turret. One would assume that the turret was more complete or able to be made to function better. The Panther II participated for two or three years until it was withdrawn because of carburetor problems. During the course of the restoration, the interior of the Panther G was gutted and the interior parts boxed and stored at the museum's repair facility. The Panther G was relegated as an outdoor monument tank which sat behind the museum along with other vehicles. Over time the Panther's torsion bars started giving out and it started to sag in the rear. Eventually it was removed and shipped to Fort Benning, Georgia where it is under cover in a pavilion storage area. One can only hope that one day the original turret, running gear and other parts will be returned to it and it can be properly restored. Click on the links below to see period photos of the Patton Museum Panther G as well as photos of the Aberdeen Proving Ground Panther G. Use your back button to return to this page to see each gallery. Hover your cursor over each photo to see captions.